I wanted to share another little peek of my new textile line... 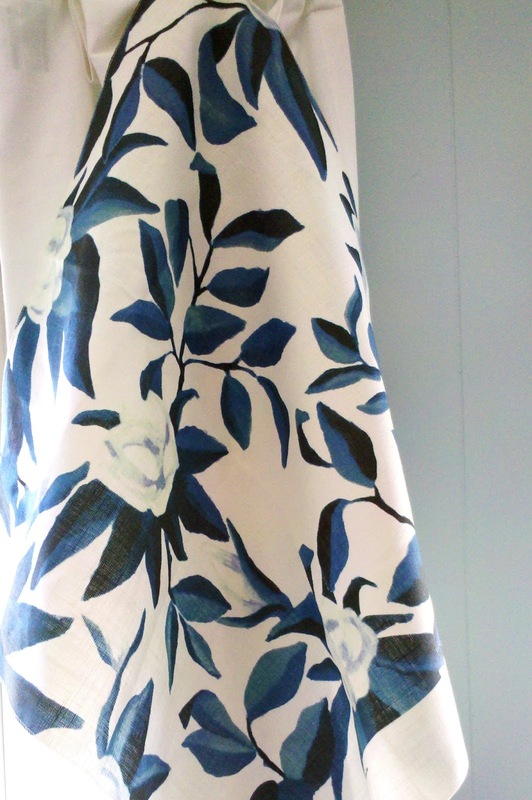 This design is called Magnolia and my friend (and super-talented artist), Kat Wright, painted it for me. It will be available in several colorways and here's a quick look at two of them, both on linen. I had to use my camera phone & the pics really don't do them justice, especially the True. I love magnolias and look out at my neighbor's massive magnoilia tree fairly often, wishing it were in my yard. For this pattern, I wanted an overscaled pretty-yet-wild feel. It's a floral but its leaves are just as prominent as its blooms which I think makes it a little less sweet. I can't wait to start using these in projects ---- eeeek!! I'm still working on finalizing pricing but hope to have them up and for sale in my online store by mid-April. ps- I looooved your ideas about outdoor fabrics so am looking into it! ppss-- I'm headed to LA this weekend to the Design Blogger's Conference and we're taking Christian to Disneyland!! Let me know if you've signed up for the Conference! Also, The DC Design House Bare Bones Tour is this Saturday from 10-4. I'll be there so stop by if you can! Click here for details. Finally, I'm joining up with Apartment Therapy on Wednesday, March 16th for a Designer Night in DC. They're still finalizing the location so as soon as I know you'll let you know. I definitely get a little nervous about public speaking so fingers crossed. Beautifully unique and uniquely beautiful! Wow, that is gorgeous, especially in the blue colorway. You're so talented! Lauren- Magnolia looks wonderful, I am smitten with the blue colorway. Have a great L.A. trip! UHG!!! That's awesome pretty!! Mid April is my birthday so yes please! Save me a few yards for some pillows? oh wow, these are just gorgeous. i can't wait to see more! Absolutely beautiful...love anything handpainted and having it done on fabric is a special luxury..love the blue in particular! Fabulous. Beautiful design, Lauren. How exciting! These are both beautiful! I love botanical prints and can already see both colorways in my home. Will you consider exchanging your Peter Dunham Fig Leaf for your green magnolia fabric?? That's gorgeous. I especially like the blue one. You should go to Emily Henderson's Secrets of a Stylist launch party while you're out in LA. Not sure what day it is but she posted about it on her blog. Beatuiful! The fabric is so you - love it. See you Saturday at Bare Bones. Look forward to the fabric being available....I know you said it would be pricey...but sometimes it is fun to splurge!!! Have fun in LA! The green Magnolia is gorgeous! 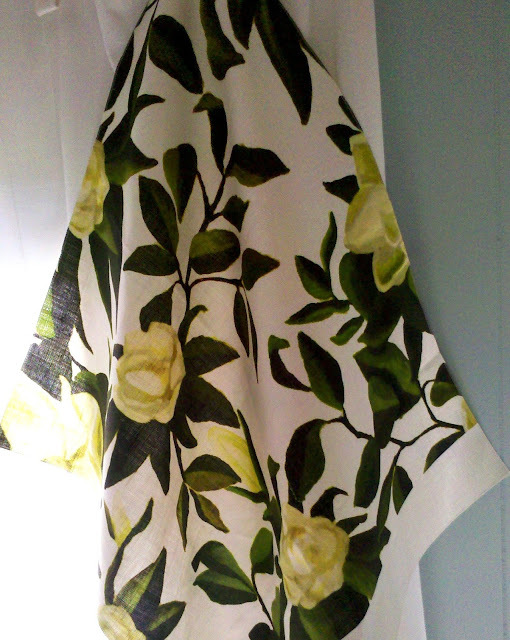 I can already envision that magnolia fabric in the green and yellow in so many places. . .
Great things happening for you! So glad. These are stunning, can't wait to purchase! These are AMAZING! BREATHTAKING! Wow. I would LOVE to pick your brain on how you created a fabric line sometime. And I'll definitely be using some of these whenever they will be launched officially! These are SO pretty!!! Congrats!!! I'm sure everyone has said this already but that green magnolia is SO YOU. Wow, you really put your personality in your fabric that is wonderful. Congratulations, this must be such an amazing time for you. Have fun at Disney! You are just brilliant. I'm shopping craigslist for some chairs to upholster in the blue colorway...I can't think of anything more beautiful! Enjoy Disneyland. My tip as an annual passport holder with little ones: Do everything early, and Peter Pan very first! (Like, be the first in line in the AM, eat at 11:30, take naps @ hotel 2-4, and then go back for the rest of the night). Have fun! Love these and would love to order the blue colorway for my Master Bedroom for a chair. Lauren, this design seems so you! I'm super bummed to be missing the bare bones tour this year!!! BUT, I'm hoping to make it to the AT night, barring anything crazy like going into labor :) You are going to be fabulous!!!! 2. Will try to stop by on Sat. for sure...would love to see it all! 3. You will do great job public speaking because you'll be talking about something you are extremely passionate about and it will show! I'm loving your new fabrics! I love both! Congrats! I'll do a feature once you're online shop is open! I LOVE these Lauren. Congrats on the line! I recently moved to the area and will definitely try to make the Apt. Therapy session. Cannot wait! Great colorways, very Pure Style. Natural tones, classic yet there's something super cool about them and the colorways. Can't wait to use! You've hit the nail on the head with this one. Perfect for all kinds of projects. I know what you mean about florals being too sweet. It's great to hear how you adressed that concern. So interesting. Good luck in your travels and speaking. Keep smiling. Love the fabric, the magnolia would be perfect for all of us Atlanta girls! Love your blog!! Lauren...stunning...love how fresh and classic but with a youthful vibe....Can't wait until they are available! Magnolia blooms are among my favorites! This is stunning! SO BEAUTIFUL!!! You are such an inspiration!! Have fun in Disney .... We go often in ca.... A few tips the park gates open earlier than time posted so u can see a few of the characters on main street before, do the early morning madness if u have those passes , eat the beignets in the French quarter so yummy! Stay away from the Astros orbitors ride- line is deceiving as it's 2-3X longer due to that! There is no best time to do Peter pan so u do - have fun! Very beautiful Lauren! Great job - you must be so excited! So fresh!!!! Really love them. Congrats on this new adventure! Hi Lauren, Love the fabrics, esp. the green. Wanted to suggest you go to the spa at the Sofitel, it's amazing and my sister is the Director! Lauren that fabric is beautiful! I love it and can't wait to use it in client projects and my home one day!! Congratulations on your line Lauren! It looks fabulous and I can hardly wait to see everything! Just beautiful. Lauren this is just beautiful!! You are so talented an I can NOT WAIT to see more from your line!! OMG Lauren, these are really beautiful! Can't wait to see the rest of the line--and find out when/where we can purchase! Lauren!!! This fabric is gorgeous! As a real live Southern girl now, I am all over magnolias. How pretty would this be as a slipcover for my dining chairs? those are both amazing! I love love love the second colorway! I love the fabrics, they are gorgeous! I am so happy to have found your blog, very inspiring.